Z3 cymbals have a lineage stretching back for almost two and half decades. Drawing on this experience, Zildjian is demonstrating its determination to be ahead of the game with the Z3s. Assertive, warm, musical and a pleasure to play. The 20" china and 15" hi-hats in particular are exceptional instruments. The 'rock' heritage might put some players off - but you shouldn't let it. 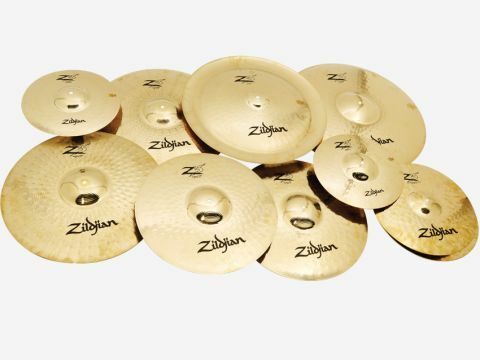 The Z3 Series is the third generation of Zildjian's range of rock cymbals which began with the Z Series in 1985. Zildjian promises more power, projection and playability from the new Z3 models (as we found out at LIMS 09), which have some choice endorsees. Cast from Zildjian bronze, Z3 cymbals are extensively hammered with precisely spaced blows. On some models the hammering is deep enough to dot the surface with significant undulations. Deep lathing bands are found on both sides of each cymbal while the bells are larger than normal on all but the hi-hats and chinas. Like the preceding Z Customs, the Z3s feature a brilliant finish to both enable projection and catch the eye. The smallest Z3 cymbal is a 12" splash and that's where we began. While a foot across might seem large for a splash in many quarters, in rocky territory it's considered essential. Next up was a trio of crashes in 16", 17" and 18" diameters. High frequencies dominated the 16" Medium crash, but the silvery quality found in the splash was evident as well. Again, it was incongruously loud and its very tuning encouraged it to slice across playing situations. The heavier 17" Rock crash did feel more substantial beneath a stick when played. It possessed a similar blast of opening brightness to the 16" crash but packed a meatier punch that made it project even further. Being thicker it also took longer to decay. We liked the 18" Medium crash the most as it combined a deeper and warmer note with its aggressive nature. The normally competing elements of musicality, power and clarity blended together seamlessly. Of the two chinas available in the Z3 series, only the larger 20" model was supplied. It performed impressively, opening with a blast of authentic trashiness. Beneath the sizzling heat was a good deal of warmth and it was possible to elicit different responses across the cymbal. We found it as responsive at the quieter end of the dynamic scale as it was at higher volumes. Great though the china was, it sounded almost polite alongside the 19" Thrash ride. Designed to provide a tumbling roll of wash, it stands out on account of its unusual straight lines of hammer marks that radiate outwards from the bell. In use, it was absolutely brutal, giving a piercing wave of wash that verged on white noise. It was loud to the point of being unpleasant and could probably rattle fillings loose at 20 yards. In other words, it does exactly what Zildjian claims. A pair of more conventional rides was included in the shape of 20" Medium Heavy and 22" Rock models. The 20" Medium Heavy ride gave an extremely bright stick sound over a light wash when played on the bow. A cymbal of this nature is probably destined to be played almost exclusively on the bell, where it asserted itself with a strong peal. The 22" Rock ride was quite a slab of bronze and produced a bigger stick sound on the bow. The bell's response could truthfully be described as mighty - deep, rich, and completely separate from the rest of the cymbal. Two sets of hi-hats from the six available completed the review selection. The 14" Mastersound hi-hats were bright and crisp and had a precise feel. Though they were stacked with high frequencies there was enough warmth present to prevent them from fizzing away in a high register like some heavier hats can. The 15" hi-hats were even more exciting, giving a lower, warmer and louder response. There is something about the extra diameter of 15" hats which makes them more accommodating. Closed, they delivered a fat crunch that put backbone into backbeats. When half-open, the wash they produced was enough to power a small town, let alone a twin guitar backline.